There’s that classic “third time’s the charm”, but it doesn’t work for OnePlus, since they made a very solid first phone, a not so impressive OnePlus 2 and then a good OnePlus X. Now the OnePlus 3 is actually the fourth and boy is it charming! We review it below, so stay tuned for some solid impressions. The handset debuted earlier this summer and it’s the flagship of the year 2016 for OnePlus. It’s priced at $399 and it was among the first few models with 6 GB RAM on board. It’s a slim metal flagship with elegant accessories bundled and it’s available in graphite and soft gold. The invite system is gone and the product was available from day one in 31 countries. In some regards, testing this phone felt like test driving a Tesla car, no kidding. The design involves a slim metal unibody case, that looks and feels great. Basically, OnePlus manages to express everything that HTC has been trying to do for years now, without succeeding. The facade is a bit similar to the one of a Galaxy A (2016) model. It measures 7.35 mm in thickness and weighs 158 grams, which is excellent compared to the 9.9 mm and 175 grams of the OnePlus 2. The good news is that this handset is 30 grams lighter than the iPhone 7 Plus. It also feels a bit slippery and has OK button feedback. 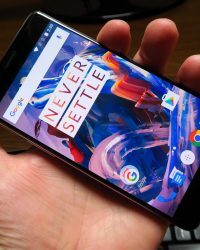 The OnePlus 3 is a long phone, which means that one hand usage is a bit of a problem. Build quality is great and we’ve got a comfy and premium approach here. This is a 5.5 incher with a gently curved back and it also brings a 3 stage mute switch on the side. The design of the back area feels a bit like a combo of the Huawei Mate S and the HTC One M9. There’s also a camera bump there, but not an exaggerated one. The design is great here and we have no objections. OnePlus 3 packs a 5.5 inch Full HD Optic AMOLED screen and this panel was tailor made by Samsung for this product. The display has an incredibly slim 0.75 mm bezel and a 2.5D Gorilla Glass 4 protection. There’s no video player here, so we had to resort to the Gallery to play video. As far as the viewing experience goes, that bezel really stands out, making it seem that the image goes into infinity, like on a Galaxy S7 Edge for example. Brightness is good, colors are very vivid and the view angles are wide. The black is deep and we’ve got good contrast. The colors feel a tad overblown, especially the reds. Pixels have a Pentile Matrix arrangement and the luxmeter showed a result of 626 LUX, which is great, but it’s not uniform, since we achieved 601 LUX in the middle of the screen and 584 LUX at the bottom. Luckily you can’t tell the difference between these areas. The biggest LUX value surpasses the iPhone 6S and Xiaomi Mi 5, which is not a bad feat. Settings include Adaptive Brightness, Color Balance (with a slider), Night Mode (becomes more yellow-ish, eliminates blue light). There’s also a Pocket Mode here, often triggered by mistake, Ambient Display (wake up with notifications) and font size. Great display overall. On the hardware front, we’ve got a Qualcomm Snapdragon 820 CPU, a quad core unit clocked at up to 2.2 GHz, with an Adreno 530 GPU and 6 GB of LPDDR4 RAM. 64 GB of storage are also on offer, plus no microSD card slot. Of course, the OnePlus 3 has no lag and it simply flies into the stratosphere of performance. Setup is fast, reset is fast, app install is fast, so everything checks out. Games work like a charm, including Riptide GP Renegade, with its great graphics. Benchmarks were excellent as well, as this model scored first spot in AnTuTu, first in 3D Mark Ice Storm Unlimited and top 3 in most GFXBench 4 sub tests. The phone is a heavy hitter, that’s for sure. It also remains pretty cool, since we achieved 31.6 degrees Celsius after running GFXBench and 34.2 degrees Celsius after running Riptide GP Renegade. OnePlus 3 has a 3000 mAh battery, a theoretical downgrade from the 3300 mAh unit of the OnePlus 2. We also get a Dash Charger, with 5V/4A output. It’s supposed to offer a 63% charge after 30 minutes. Our HD video playback test offere us a time of 7 hours and 58 minutes, which is just reasonable, or quite good for a slim waistline. It’s clearly below the huge 15 hours of the Galaxy S7 Edge, or the 12 hours of Xiaomi Mi 5. Even the OnePlus 2 was superior, with 9 hours and 10 minutes. At least we surpassed the ASUS ZenFone 2 and Huawei P9. The PCMark test offered 8 hours and 4 minutes of continuous usage, which is great. We surpassed the Galaxy S7 by 2 minutes, as well as the Xiaomi Mi 5 and the OnePlus 2 with its 6 hours and 25 minutes. Still, we scored below the Huawei Mate 8 and the Galaxy S7 Edge. Charging is done in just one hour and 10 minutes, an excellent result and equal to the one of the Galaxy S6. Still, there’s a better performer here, the Galaxy S6 Edge+, that juices up in 1 hour and 5 minute. Settings include the stock options Battery Saver and Battery Optimization. It’s a pretty OK battery, minus the video playback. On the audio side, you should know that we get no bundled headphones, but at least we have an audio jack. There’s also Dirac Power Sound tech and the bottom speaker has 6 holes and it’s easy to cover with your hand when the phone is held in landscape mode. The Music player is nice looking, but there’s no EQ here. The acoustic experience brings us great volume, nice clarity, solid bass and the sound is great all around, reaching a flagship level. The decibelmeter test revealed a value of 82.6 dBA with our usual audio test sample, but in games and music we surpassed 90+ dBA. This means we beat the OnePlus 2 and we were pretty much on par with the OnePlus One. Google Play Music is also bundled and there’s no FM radio. Let’s discuss the camera now! OnePlus 3 has a main 16 megapixel camera, with 1.12 micron pixels and a Sony IMX 298 sensor, that you can also find on the Xiaomi Mi 5, Huawei Mate 8 and ASUS ZenFone 3. The cam offers OIS, EIS, PDAF, F/2.0 aperture, 4K video and slow motion at 120 FPS. There’s also RAW capture. The selfie camera has a Sony IMX 179 sensor, an 8 MP one with 1.4 micron pixels and F/2.0 aperture. The camera app starts up fast and also zooms fast, while the focus also had good speed. Pics were taken instantly and I also noticed an interesting HQ mode in the UI. It’s supposed to serve to reduce shutter speed in low light conditions, according to experts. Then there’s HDR (On, Off, Auto) and the camera UI brings a circular slider for brightness. Options are rather limited, so aside from the grille and aspect we don’t have many tweaks. There’s Time Lapse, RAW capture, slow mo, photo and up to 4K video. We’ve also got a manual mode, with focus, shutter, white balance and ISO tweaks. Panorama is also here. Now let’s see how the phone handled day time shots and indoor photo capture. It was a cloudy day and the indoor shots were taken at a local launch of the ASUS ZenFone 3. Indoor images feature nice colors and clarity, but the moving objects were a bit blurry. Clarity was perfect and this model is clearly superior to the Xperia XZ indoors, since we also carried the phone with us at the event and took shots with it. Outdoors we had a very cloudy day, but caught great details in landscape shots. Selfies were rather good and the face was very crisp, but the background was a bit blurry. We had a great texture of that all glass hotel and when we zoomed into the pink rose field, we registered great details and lost none. Closeups were perfect, but I missed a few shots before being able to take a good one, because focus close to the subject is on the slow side. The Panorama is generous, with 25.430 x 3456 pixels and great details. HDR is a bit artificial and there were times when I felt that the green hues were a bit artificial, like on the Xiaomi Mi 5. Luckily, the sky was made to feel more realistic by the same HDR. Clarity was perfect and details were good overall, plus we had great dynamic range and exposure. The focus may be the only problem, in closeups. I’d put this camera on par with the Galaxy S7, iPhones, LG G5 and HTC 10. It’s clearly superior to the OnePlus 2, way superior actually, although the selfie was good on the OnePlus 2 as well. Low light pics were fantastic, as far as lighting goes and we were on par with the excellent Huawei Mate 8. There was no blur and the street light halos had perfect sizes, without being overblown. Sometimes the picture capture felt like the day time one, thanks to great clarity. The flash was powerful and simply put, the camera cannot fail, when it comes to picture taking. I was very impressed by this low light capture, even in comparison to the HTC 10, which is a landmark in that field. It even beats the Sony Xperia XZ by a bit. Video capture is done in MP4 format, at Full HD, with 29 FPS frame rate and 20 Mbps bitrate. 4K videos jad a 54 Mbps bitrate. Indoor clips were grainy and focus loss was present when zooming in. There’s an OK mic, though. Outdoors we had a shaky capture, fluctuating exposure, but the 4K clip was perfect. Slow motion was very nice looking and the video shot on the edge of the lake was good, but just good doesn’t cut it anymore, in the world of flagships. There’s pronounced detail loss when zooming in. At least colors and clarity were good, but nothing special in the end. I’d say the Nexus 6P films better and so do the iPhones. Looking at the OnePlus 2 and its constant refocusing, plus image burn, the video capture has clearly improved on the OnePlus 3. It only feels like a good midranger. Low light video was rather poor, with refocusing, grain and detail loss. Everything was shaky, the wind killed the microphone and there was ghosting and a yellow image. I expect more and this is definitely not a concert phone. The web browser preinstalled here is Chrome, which is fast, has good benchmarks and we also met with a good keyboard, the stock one. 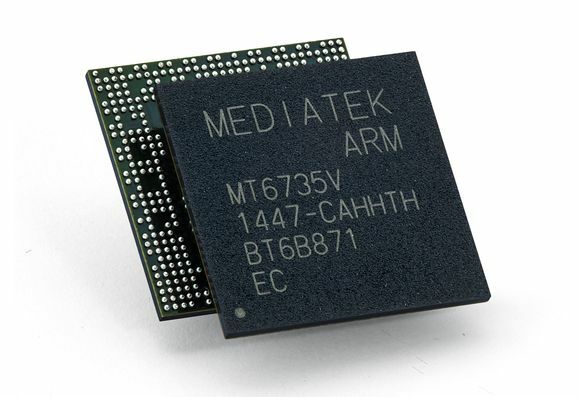 On the connectivity front, we’ve got an USB Type C port here, LTE Category 6 support, WiFi a/b/g/n/ac, Bluetooth 4.2, NFC, GPS and Glonass. The dual SIM slots are of the nano SIM kind and then there’s also WiFi Direct and DLNA. Calls are loud and clear, there’s good noise cancelling and the signal was OK. We did some Speedtests and achieved 62 Mbps in 4G downloads and 45 Mbps in upload, a pretty good result, plus 152 Mbps in WiFi download and 25 Mbps in upload. Connectivity is great overall, so no qualms here. We’re running on Oxygen OS 3.1.2 here, on top of Android 6.0.1 Marshmallow, one of the cleanest experiences I’ve seen on Android. As you know, OnePlus gave up the Cyanogen partnership because of a fall out with the company. The result is Oxygen OS, their own take on Android, with Material Design at its core. Multitasking is based on a carousel and the dropdown area includes the usual notifications and Quick Settings. Keep the homescreen pressed and you’ll gain access to wallpapers, widgets (stock) and some customization options. Swipe up and you can search for images, maps videos or news. The special feature of this platform is called Shelf and it’s a special place to store essential items. It has its own wallpaper, a note taking area, widgets for most used apps and contacts, plus more. We’ve got double tap to wake and the Settings offer us options related to the button on the side (Priority, All Notifications and Silent). You can also customize the role of double presses on the capacitive buttons, or long presses. The customization area lets you use a dark theme, mess around with LED notification, status bar and gestures (draw symbols and more). Encryption is here and the fingerprint scanner is very fast and accurate, plus it has a natural way of interaction, unlike the OnePlus 2 one. Keep the Home button pressed in certin areas, likes sites, the gallery and more and you’ll get contextual info. It even recognized a car and cake in the pictures we showed it. The preinstalled apps list includes 24 names, so no bloatware here. Only stock apps and this makes us feel that we’re dealing with a Nexus derivation of sorts. Time for the verdict, so let’s draw the conclusions. For $399 this phone offers a lot of goodies, being the best bargain in 2016. Other phone makers offer similar or worse specs at double the price, which is shocking. It can be considered a Nexus replacement, now that the series is done and we also get a very clean Android. There are too many high points to ignore here. We’ve got a great display, great camera, great performance, great audio, design and UI. Only small camera setbacks and video playback time are drawbacks, otherwise it’s the perfect phone. One of the best candidates for the “phone of the year 2016” title. The updated price is here.